I've always been a bit of a geek and always a fan of science fiction, so The Geeky Chef Cookbook is right up my alley. Funny thing is that I wasn't totally familiar with all the foods covered in the book. I knew the foods from Star Trek better than I should admit, and I was tickled to see the Pan Galactic Gargle Blaster from Hitchhiker's Guide to the Galaxy. I knew some of the foods from Star Wars and Lord of the Rings, but I guess I was more interested in the plot than the food, so I wouldn't have thought of them until the book reminded me - and then I remembered them. Oh yeah. Lembas. And I was a tiny bit frightened by Soylent Green. On the other hand, I know about Mario Brothers and other games of that era, but I really didn't play them, so I wasn't at all familiar with the names of those foods. But that's okay - there's enough that I'm familiar with and enough other recipes that looked like fun. I mean, 1Up Mushroom Cupcakes from Super Mario Brothers and the cake block from Minecraft are cute. But here's the deal. The recipes are real recipes for real foods that pretty much anyone would be happy to eat. There are drinks, appetizers, stews, meats, and desserts that look good, and the ingredients aren't weird. A few of the recipes use food coloring to match the original versions, but most are completely natural. Even the Soylent Green could be good. It's mostly spinach, but I'm still not tempted to make it soon. 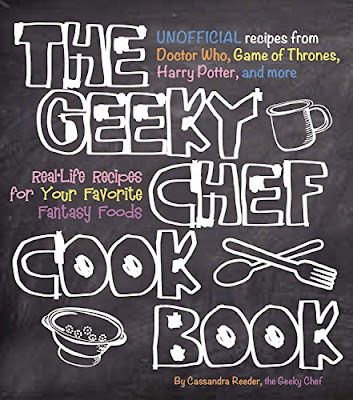 There are too many other recipes that I'd make first, like the Popplers from Futurama, or the Dragonbreath Chili from World of Warcraft, or the Cheese Buns from The Hunger Games or Rock Sirloin from Legend of Zelda. Maybe I'll wash the food down with some Ambrosia from Battlestar Galactica. And for dessert, maybe some Chocolate Salty Balls from South Park or Treacle Tarts from Harry Potter. If you're a fan of any of the sci-fi or fantasy genres, this book is a real hoot. If you want to cook some good food for people who like those genres, I think you'll like this book a lot. And if you just want to cook some fun food with quirky names, this one is worth a look.